There are lots and lots and lots of places to take pictures at Disney, and sometimes you can find some photography hints in the signage. Do you know where to spot this arrow and what it's pointing to? There were some good guesses on instagram for last week's Where in WDW photo, but KJ got it - that Coca Cola sign can be found outside Test Track at the Cool Wash station. Find Disney Scavenger Hunts here. Find more Disney World trivia posts here. You don't have to be staying at Disney Resort to really enjoy it. The Disney World resort hotels are basically like mini theme parks, and day guests are welcome to visit and explore the lobby, grounds, shops, and restaurants. Today we're looking at Disney's Animal Kingdom Lodge, which has savanna overlooks with animal guides to answer any questions, fun activities like cookie decorating and and animal viewing with night vision goggles, beautiful displays of African art, delicious dining (BOMA), zebras, zebra domes - there's plenty to do here. But my favorite way to do a resort day is to just relax. We're taking a tour of this gorgeous resort by looking at five gorgeous places to take it easy AKL-style - for resort guests or day guests! These spots are all at Jambo House, the original Animal Kingdom Lodge building - although there are lots of beautiful spaces over in the DVC building, Kidani Village, too. This time last year I was just returning from an amazing family trip to California and Disneyland. We had a great time exploring Los Angeles and museums and the beach and experiencing Disney West-Coast style! When we got home, I was so excited to get started editing the videos I had taken but daunted too - there were hundreds of files. It all started with an early flight and finding some California PALM TREES. ...we headed to La Brea tar pits to visit mammoths and giant ground sloths and dire wolfs. ...and then CARSLAND! I'm *still* not over how cool Carsland is. ...and had some fun on the Red Car Trolley. We headed back to Disney California Adventure that evening for two not-to-miss sights: Carsland at night and World of Color! The next day it was time for Disneyland park!! Their Big Thunder Mountain Railroad is the coolest thing. We ended the day and the Disneyland portion of the trip with fireworks from the tea cups! For our last few days in California, we stayed at the beach near Oxnard, visited the San Buenaventura Mission, attended a family wedding, and stopped by as many epic California burger joints as we possibly could. As many of you guessed last Wednesday, that ice cream cone table can be found outside Beaches and Cream at the Beach Club Resort! Ready for some new Disney World trivia? Look closely, and you'll realize this is no ordinary street sign - it's a Coca Cola crossing! Do you know where at Disney to find it? Earlier this year I put together a Disneyland Scavenger Hunt, and now I've got one for Disney California Adventure! Ready to test your knowledge? 1. Where at DCA can you purchase a loaf of Mickey bread? HAPPY FRIDAY, FRIENDS! Ready for some pixie dust? currently reading...Complete Stories by Dorothy Parker. I bought this book last fall and pick it up every now and again to try another story. "The Waltz" has me chuckling at the moment. So much snark. currently geeking out about (along with everyone else in the world)...THE NEW STAR WARS TRAILER. Ahhhhhh....Han and Chewie! And the crashed star destroyer! I so so so hope the new movie is good...I can't wait to check it out. currently blog browsing...these pretty photos from Root Weddings. Love the bride's dress and the pop of purple in the flowers - and that venue is so gorgeous! currently excited for...props to Corinne for giving me the heads up on this one...Lauren Conrad had a Cinderella collection out this spring at Kohl's, and now she has a new Minnie Mouse collection on its way! The polka-dotted pieces look so cute - it comes out May 10th. currently watching on YouTube...an improbable recipe for strawberry pie with the Kids Snippets crew. currently watching on tv...Tuesday nights are my favorite because DUGGARS. I just love 19 Kids and Counting - Jill's new baby was just born, and there's another Duggar courting! You can't help but smile when you walk by a table shaped like an ice cream cone! It's even got sprinkles. Have you ever passed this somewhere at Walt Disney World? Mondays are better with something tasty, don't you think? A few weeks ago my family went on a day trip to Princeton, NJ. We went to Mass at the beautiful St. Paul's Church and then had some time for brunch before our next stop. Strolling through the downtown area, we ended up at a place called Agricola. It did feel very trendy but also very fun! They call themselves a "community eatery" rather than a restaurant, and the menu was full of interesting dishes made with fresh, local produce. I was tempted by the Breakfast Flatbread, but in the end I couldn't pass up the Blueberry Ricotta Silver Dollar Pancakes. This time it's a Lion King family suite at Art of Animation Resort! Art of Animation is classified a "value plus" resort, which puts in a similar category to Pop Century and the All Star Resorts. To me it feels newer, fresher, and more detailed than the older values in many ways, and it offers family suites which will accommodate larger parties. currently reading...Schubert's Winter Journey by Ian Bostridge. Confession: I picked this book up from the shelf mostly because it was so gorgeous-looking - the cover is a smooth, snowy white with almost-invisible embossed footprints. Now I'm really enjoying learning more about Schubert and his Winterreise cycle. currently listening to...Honey, I'm Good by Andy Grammer. I just can't get it out of my head! Also: Bright by Echosmith just makes me smile. currently craving...the new Cinnamon Sweet Churro Milkshake at Min & Bill's at Hollywood Studios. I'm still so sad they got rid of their amazing chicken salad sandwich, but this new sweet treat sounds delish. currently handbag dreaming...of Vera Bradley's new Pixie Blooms and Pixie Confetti collection. I'm also so tempted by the coral laser-cut crossbody. It looks like the perfect size to hold a book! ...also...have you see the new Disney Dooney & Bourke designs? Disneyland has some new patterns coming for the Diamond Celebration, and Marketplace Co-Op is getting some new summer styles! currently blog browsing...Cycle Chic is one of my favorite sites to scroll through. Love the bicycle hair styles and golden evening light. ...after all, there are so many things to do at Walt Disney World you might not think to add bowling to your list! Of course we are at Disney, so it's not going to be quite like bowling anywhere else! Shall we give it a try? We're heading to the West Coast to visit the San Buenavantura Mission (and take in some fun California eats!) in today's post. 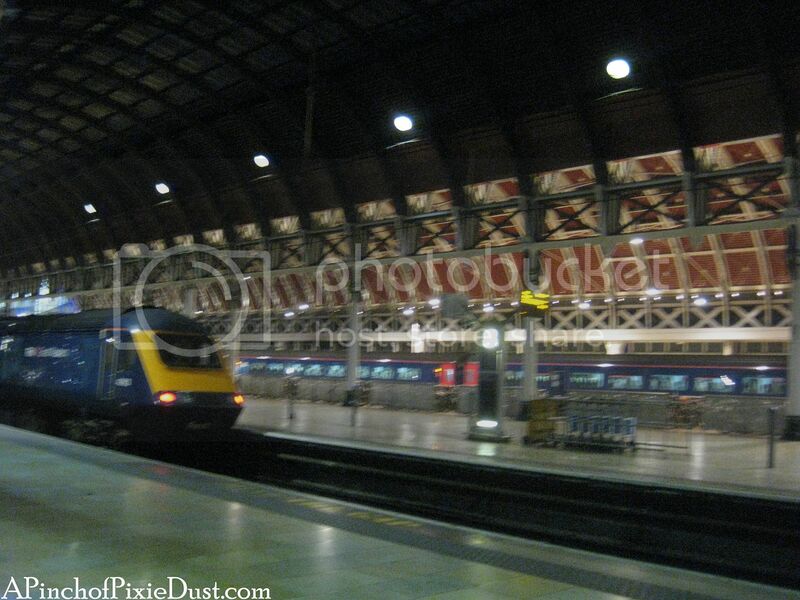 I woke up very early and left my hotel and Big Ben behind to get to Paddington Station and catch the Heathrow Express train to the airport. I caught one of the first trains of the day - I think they start around 6:00 am, and there's one every fifteen minutes. 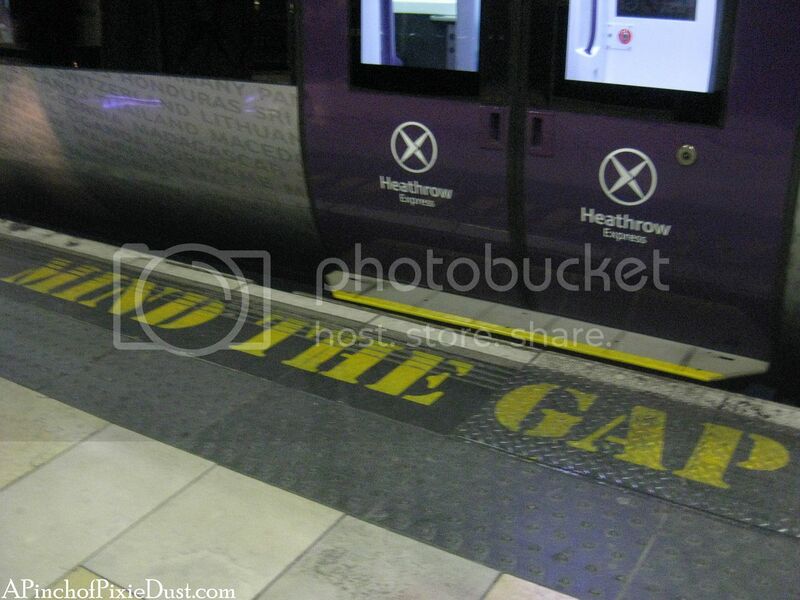 One last "MIND THE GAP!" ...and you can find those two figurines in real life somewhere at Walt Disney World! I'm making this an optional Where in WDW trivia post - find the answer after the break. As for last week's trivia photo, that cheerful Mickey pillow is from the rooms at Disney's Contemporary Resort.